If you are running msysgit (I am assuming you are) and are looking to run Git Bash (I recommend it over TortoiseGit, but I lean to the CLI more than GUI now), you need to figure out what your home directory is for Git Bash by starting it then type pwd (On Windows 7, it will be something like C:\Users\phsr I think). While you're in Git Bash, you should mkdir .ssh. After you have the home directory, and a .ssh folder under that, you want to open PuTTYgen and open the key (.ppk file) you have previously created. Once your key is open, you want to select Conversions -> Export OpenSSH key and save it to HOME\.ssh\id_rsa. After you have the key at that location, Git Bash will recognize the key and use it. Note: Comments indicate that this doesn't work in all cases. You may need to copy the OpenSSH key to Program Files\Git\.ssh\id_rsa (or Program Files (x86)\Git\.ssh\id_rsa). When using TortoiseGit, you need to set the SSH key via pacey's directions. 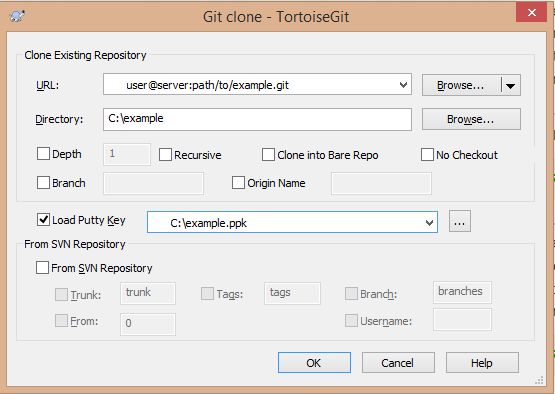 You need to do that for every repository you are using TortoiseGit with. Using the built-in SSH client shipped with Git for Windows, you need to set up the HOME environment variable so that the Git SSH client can find the key. For example, on a Windows Vista installation, this would be done by issuing setx HOME c:\Users\admin\ on the command line. It made my day and fixed the issue with Git provided that your private key is not password protected. If you want to use ssh-agent, then you can probably run ssh-agent cmd.exe (although I've never done that) and the ssh-add as usual. Note that all Git/SSH tools are supposed to be run from a cmd.exe in order not to blink a window. If this does not work correctly, using plink can probably be achieved by tweaking GIT_SSH. Refer to all the SVN + ssh tutorials; this is basically the same plumbing you need to setup. Set the path to your PuTTY key in the corresponding input box. None of the previous answers worked for me. Here was what worked for me in the end. It is actually fairly simple, if you know what to type. It doesn't need PuTTY. If it lists the files in your home directory on the Git server, and then you're done! In Git Bash, type 'cat ~/.ssh/id_rsa.pub', select the result, and copy it to the clipboard. On the GitHub website, go to 'Account settings', 'SSH and GPG keys', click 'New SSH key', and paste the key. If you're using msysgit with the OpenSSH tools, you need to either create ~/.ssh/id_rsa, or create a Git configuration in ~/.ssh/config which points to your key. Here's an example of a Git configuration for Bitbucket that will use the correct username, and a key other than the default key (in case you maintain one key for SSH connections, and another for Git accounts). Once in Git Bash, you can run two commands to add your key to your current session's ssh-agent to avoid having to repeatedly type the key's password. This has the advantage of working for all users logged into the system (they each get separate .ssh folders). In my case I was using Git for Windows in the Docker container windowsservercore. My Git was installed by Chocolatey to C:\Program Files\Git. If you are using Git for windows together with OpenSSH for Windows. Git is still using its own ssh. Plus if you plan using ssh-keyscan host.com > known_hosts from OpenSSH, be careful because piping output from stdout of keyscan (on Windows) changes encoding to UCS-2, but OpenSSH can read only UTF-8! So make sure to change the known_hosts file encoding. OK, I looked at the suggestion of .. But placing in my private SSH keys in public folder I didn't think was a good idea, so I started to look for where the knownhost was. Download pageant.exe, puttygen.exe, putty.exe and plink.exe from PuTTY's website. Place them in C:\puttyTools directory. Wiggle the mouse around in the top part of the window until the progress bar is full, as the program asks you to do. Provide a passphrase, and repeat it in the subsequent textbox. Click "Save private key". The usual directory to save these in is %USERPROFILE%\_ssh (in my computer this maps to C:\Users\andres\.ssh\). It doesn't matter what you call the key, but for demonstration purposes, I'm going to call it github.ppk. This file should have an extension of .ppk. Copy the text in the top text box in PuTTYgen, the one labeled Public key for pasting into OpenSSH authorized_keys file and paste it into a new SSH key in GitHub's settings. Give it a title that describes what machine the key is on (e.g. "Work laptop"). Run pageant.exe, a new systray icon will appear. Right click on the icon -> Add key. Locate your ppk file, enter your passphrase. Create these new user environment variables (via looking for application Environ through WindowsMenu which will find Edit environment variables for your account): GIT_SSH = "C:\puttyTools\plink.exe" and SVN_SSH = "C:\puttyTools\PuTTY\plink.exe"
Open putty.exe and try to connect to the host where you host your Git repositories. For example, try to connect to github.com via SSH, and a dialog will ask you if you accept the fingerprint of the server: click on YES. Run a new instance of your MINGW64 Git console, and verify that the environment variables are there by writing the command env | grep -i ssh. You should be all set. Try to clone with the Git + SSH protocol from your host. The standard location for the files is in %USERPROFILE%\.ssh. %USERPROFILE% is the equivalent of $HOME in Unix (normally maps to something like c:\users\youruserid). If you are using the SSH tools that came with Git, which are the standard command line Unix-style tools, you can use something like my script here to work with ssh-agent across all shells. Once I created a new keypair and uploaded the public key to GitHub, things started working again. Pageant (an SSH agent supplied with the PuTTY bundle) solves the problem for me. Many answers say this, but for me not fast enough! If you're on Windows 7/8, you should look in C:\Users\Your_User_Name.ssh Just copy & paste your id_rsa file here and it will all work out-of-the-box. One mistake I made when using SSH on Windows was that when I attempted to use the keys through the Git Bash client, all of the files within ~/.ssh were the wrong permissions, yet it did not attempt to tell me that it was a problem. Just as a test, make sure you've set everything in your ~/.ssh directory to chmod 600. If you have the necessary permissions on the Windows machine, and your policies permit it, I would suggest installing Cygwin (https://cygwin.com/), especially considering that you have prior experience with Linux. Cygwin will make it possible to handle your ssh-keys as you would on any other Linux/Unix machine. And it provides access to almost all of the cli tools of Linux. Reading your comment to Declan's answer, try opening a command prompt first (Start → Run → cmd) and then navigate to that git/bin folder and run ssh-keygen. Theoretically that will generate an RSA key and place it in the appropriate directory. Then you just have got to find it and share your public key with the world. The reason that the window "blinks" is because Windows runs the program, and when it executes, it closes the command prompt, thinking you're done with it, when you really need the output. Using v0.17 of Git Gui on Windows I clicked on the following menu command: Help → Show SSH Key. A dialog appeared entitled Your OpenSSH Public Key. I generated a key and copied it to the clipboard. Then I continued to follow the setup-ssh instructions on githelp from Step Three onwards. Afterwards Git Gui communicated with GitHub silently - no need to enter any credentials. On my Windows 7 system Git Gui looks for the RSA key in the userprofile/.ssh folder or more specifically c:/users/yourusername/.ssh/. The tricky part for my setup was getting the shared host at hostmonster to accept the key. The only way I could get it to work was by using Git Gui to create the key pairs (without a password) and then copy and pasting the public key via the control panel, ssh, manage keys. To start at the beginning, you have to create the keys in Git Gui by going to menu Help, Show SSH key, then Generate Key. Now you will have two new keys in the .ssh directory. Open the .pub file and copy the contents. Log in to your control panel on the shared host and go into SSH, Manage SSH keys, and Import key. Paste into the Public box, and make sure you name it the right name without the extension-- mine was id_rsa. Now you must authorize the key using the manage authorization link, so it will get concatenated into the authorized_keys file. Now your Git Gui and your Git Bash should be able to push using SSH without having to type the password. Oddly, I was able to push using SSH via Git Bash and Git Gui just fine on my own servers running Linux, it was just the shared hosting that was giving me fits. I hope this helps someone as it took me hours of trial and error to come up with this--and it's so simple! Open cmd.exe and execute setx HOME c:\PATH_TO_PRIVATE_KEY. Create a new folder, .ssh, (if not exist) inside c:\PATH_TO_PRIVATE_KEY and copy your id_rsa file (your private key) into it. Done. Now you can use the Git command line normally. My msysgit OpenSSL/Bash Git experience (not PuTTY's plink) is that the search order for your the .ssh/ folder is as follows. Hi kcd83! You've successfully authenticated, but GitHub does not provide shell access. We found ssh searching on an obscure drive and none of the previous answers seemed to explain what we saw. Sometimes %HOMEDRIVE%%HOMEPATH% is a mapped network drive (e.g. H:/) which causes unnecessary failures when there are network/fileserver issues, even when %USERPROFILE%/.ssh is C:/Users/Username/.ssh and has the keys locally. Setting %HOME% to %USERPROFILE% stops it looking at the remote home drive. You can also load PuTTY Agent (pageant) and add the private key you generated with PuTTY for the server. Git recognizes this and uses that for push/pull. You can of course change the path to wherever your key is located, remembering to use \\ as the separator. If using Git for Windows, once the SSH keys have been generated, you must add your SSH key to ssh-agent. See Generating a new SSH key and adding it to the ssh-agent.